Advertisements can be found anywhere: on the glossy pages of magazines, on the gigantic hoardings across the street, on TV and on the Internet. The channel used will obviously also affect the format or packaging of the advert and the structural and linguistic choices. However, regardless of their medium and packaging, all adverts – whether print ads, hoardings, commercials or banners – mix verbal and visual elements. Furthermore, ads often imitate other genres and masquerade as other kinds of text – for example, a commercial may imitate a James Bond movie, an advert for a brand of healthy food may incorporate a recipe. Finally, also the register used in advertising is mixed as it conflates formal and informal features, and blends characteristics of written and of spoken English. For example, the sequence of adjectives and premodifiers points to a “writerly” style, while syntactic choices may be more typical of a chatty register (Make a move! Go and get it!). Pictures are an essential component of advertising as they are meant to enhance the objective and associative qualities of products. Besides pictures, also graphology – i.e. the page layout and visual aspect of words – conveys connotative meanings. Take, for example, the headline in the ad for the Canon printer. 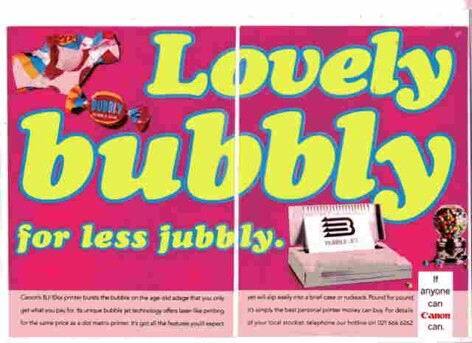 The huge and rounded characters on a pink background have playful associations, which are further reinforced by the pun on bubbly (bubble-jet printer and bubble-gum). The artful visual suggests that using Canon technology is a “lovely bubbly” and fun experience. Have a look at the slogans below and notice how particular graphic effects emphasise the iconic and emotional value of letters. Try to identify the product advertised. Slogan for Clarks shoes. The zigzag suggests the bouncy and energetic stride which should come with the right shoes. Slogan for Frieda hair colour. 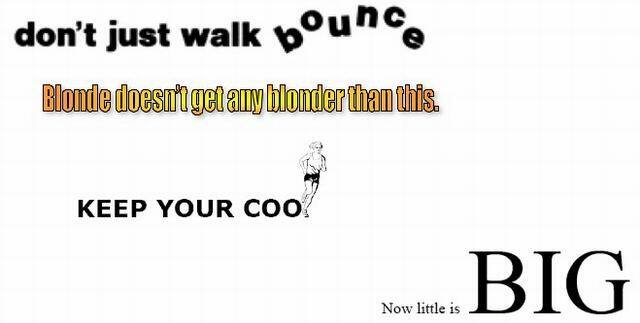 The yellow fonts evoke blond hair with streaks of reddish. Slogan for a brand of deodorant. The slender female figure in sportswear evokes physical training. Slogan for IBM technology. Nowadays, small size guarantees top quality performances. Advertising promotes the new, by making use of a novel and almost revolutionary “poetic diction”. New words in ads are very frequent and comply with the rules of word formation (Trask 1997: 240). AFFIXATION: the process of obtaining words from other words by adding affixes (prefixes and suffixes). Examples: historical, prehistory derived from history. COMPOUNDING: the process of forming words by combining two or more smaller words. Examples: teapot, armchair, fairy-tale. BLENDING: the process of forming words by combining pieces of other words. Examples: brunch (breakfast + lunch), smog (smoke + fog). It’s designed for men only. It’s got protein for strength. It’s soap free to prevent stripping and it looks after your scalp. Scientifically boring, but the shampoo works. The sequence of simple sentences starting in the same way (It’s) in the example above is typical of an informal, spoken register. Moreover, the frequency of indexicals (it, your) and verb contractions (’s) point to a colloquial style characteristic of spoken interactions. Add dazzle to your smile. Add moisture and a pearly shine to bring out their natural shimmer with Nivea Lipcare and Shine. However, the lexical choices (dazzle, pearly shine, shimmer) are rather sophisticated and typical of a more formal style. Splash your lips with liquid diamonds… LIQUIFY! A high shine glossy liquid colour fused with molten diamond shine. Glides on slicker than slick. Add some flash to the splash! The lexical choices appear rather far-fetched and also amusingly inappropriate. Expressions such as splash your lips, liquify, liquid colour fused with molten diamond shine reinforce the concept of liquid shine as the main asset of the lipstick advertised above. Paronomasia (that is, repetition of sounds) and rhyme (slicker than slick, flash to the splash) combine with hyperbole and further contribute to the very elaborate style of this advert. In conclusion, advertising mixes features of an informal, spoken register (syntactic choices) and of a formal, elaborate style (lexical choices and rhetorical figures). Advertising very often imitates other genres in a kind of amusing and liberating masquerade, which hides its character of commercial transaction. Intertextuality – that is the reference to other texts and genres within a text – is used to reinforce a promotional message by exploiting the association with scientific or humorous discourses. The ad is made to look like a medical report, a nursery-rhyme, a letter, a cartoon, etc. In each disguise, the advertisement adopts the conventional structure and linguistic characteristics of the genre imitated. 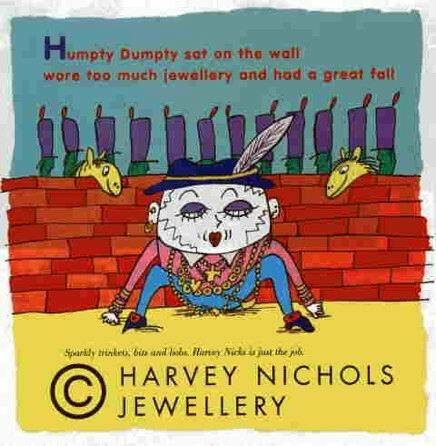 Both the verbal and the visual code refer to Humpty Dumpty, one of the most famous nursery rhymes in English, especially after Lewis Carroll re-elaborated on it in Alice’s adventures. The colourful picture combined with the rhyming couplets attach playful and poetic associations to the jewels, “sparky trinkets” for a children’s costume party. The provocative slogan for Citroen obviously refers to the famous statement by Belgian artist Renée Magritte, This is not a pipe, placed underneath the painting of a pipe. However faithful a picture or a photograph, it can never be the real thing…. R. Carter, S. Cornbleet, 2001, The Language of Speech and Writing, London, Routledge. C. Pennarola, 2009, Nonsense in Advertising. Deviascion in English Print Ads, Napoli, Liguori. R. L. Trask, 1997, A Student's Dictionary of Language and Linguistics, London, Arnold.